The first major German court case against Volkswagen over the "dieselgate" scandal that has shaken up the car industry gets under way Monday, as investors pursue the world's largest automaker for billions in compensation. From 10 am (0800 GMT) the regional court in Brunswick will examine whether the auto giant should have informed investors sooner about so-called "defeat devices" it built into 11 million cars worldwide to fool regulatory emissions tests. On the first day, "we are hoping for first indications from the judges about their view of the facts and the legal position," said Andreas Tilp, a lawyer representing investment fund Deka. The shareholder's "model case" against VW is supposed to clear up more than 200 questions common to some 3,650 claims totalling around 9.0 billion euros ($10.5 billion), with judges expected Monday to highlight timelines and priority issues in the massive case. After markets closed on Friday, September 18 that year, US authorities accused the group of using the defeat devices—engine software designed to cut harmful emissions during regulatory tests, only to allow them to rise again during on-road driving. Investors say they could have avoided painful losses had executives—who are legally obliged to share promptly any information that could affect the share price—informed them sooner of the cheating. 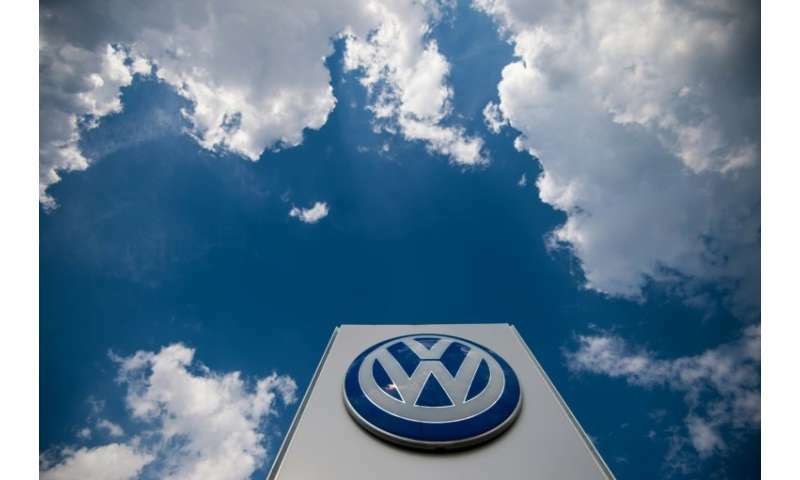 Ahead of Monday's hearing, Volkswagen lawyer Markus Pfueller said the group was "confident" that it had "complied with its disclosure obligations toward shareholders and the capital markets". At the centre of attention in the court case will be Martin Winterkorn, the trained engineer who claimed to know "every nut and bolt" of Volkswagen's entire range of models and ran the company as chief executive from 2007 to 2015. VW said in 2016 that Winterkorn—who stepped down after the scandal became public—was sent a "memo" highlighting emissions irregularities in the manipulated EA189 engine, without confirming whether he ever read it. But the "dieselgate" scandal has revealed the flipside of the technology, nitrogen oxides (NOx) emissions that can be harmful to health. Another investor probe starting Wednesday, against Porsche SE, the holding company with a controlling stake in VW, could be stalled or superseded by the Brunswick case. Rupert Stadler, CEO of VW subsidiary Audi, is in custody on suspicion of fraud and issuing false certificates, and VW-owned Porsche, Mercedes-Benz manufacturer Daimler and components supplier Bosch are in prosecutors' sights. The EU has toughened emissions testing with a new procedure known as WLTP, which comes into force this month. Consumers have reacted to the prospect of more bans by shunning diesel, sending its share of the new car market plunging from 46.5 percent in August 2015 to 32.6 percent last month. 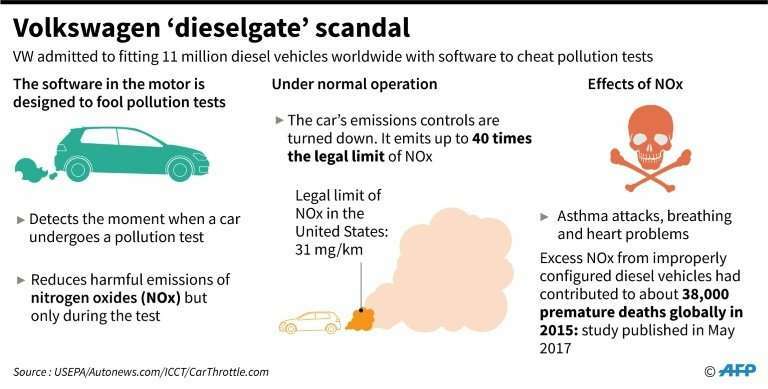 Graphic on the Volkswagen emissions cheating scandal. The first major court case against Volkswagen over its cheating of emissions tests on 11 million diesel vehicles worldwide begins Monday. Here are six things to know about the trial. The case in Brunswick, near VW's Wolfsburg headquarters in northern Germany, focuses on the plunge in the mammoth group's share price in September 2015. After American authorities revealed its mass diesel cheating, the stock shed some 40 percent in two days. Now investors are demanding compensation for their losses, saying Volkswagen should have warned them sooner about the risks. This is the first major trial related to "dieselgate" in Germany, where previously only a few individual customers have brought the carmaker to court and the results have not been made public. In the US, VW settled claims with customers for some $14.7 billion, and two former managers were jailed. While Monday's case deals with the technical aspects of how and when the group communicated with financial markets, the court will have to lay out a timeline of the scandal and determine when executives knew about the cheating. Such details are vital to ongoing criminal investigations in Germany. What must the court decide? Brunswick judges will rule on more than 200 questions submitted by the two sides in the case. Among the most vital are whether VW should have let investors know about its cheating software, whether it deliberately covered up the information, and which board members knew what—and when. The answers will then be carried over to more than 3,000 pending court cases from investors against VW and Porsche SE, the holding company that owns a controlling stake, to determine whether compensation should be paid out. What are the risks for VW ? In total, the shareholders represented in those over 3,000 cases are demanding 9 billion euros ($10.5 billion) in compensation. But if judges rule against VW, it will be up to the courts to decide in each case how much is owed. 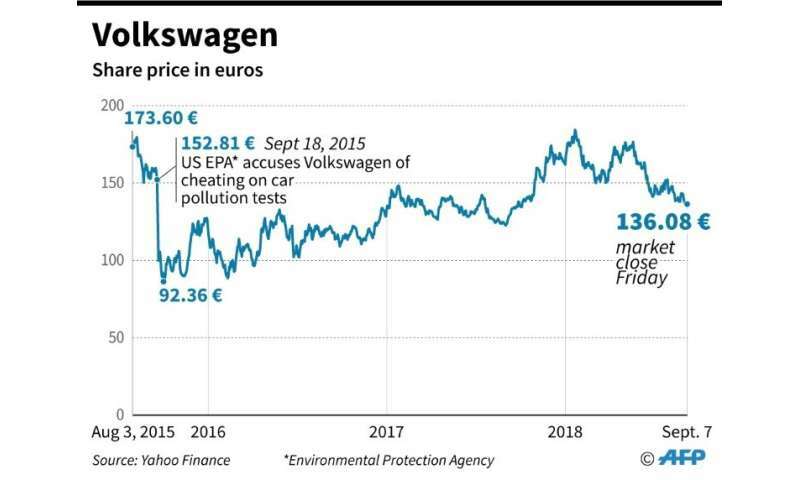 So far, the group has paid out more than 27 billion euros in fines, legal costs and buy-backs over dieselgate in Europe and the US. Lawyers for investment fund Deka, whose case is a "model" for the others with similar characteristics, argue VW should have informed investors at several points between 2008—the time of the cheat software's first deployment—and September 22 2015, when it first admitted to the fraud. They argue that managers knew about the so-called "defeat device" and that that information would likely have an impact on the group's share price. The world's biggest carmaker says that information available at the time did not make communicating with shareholders legally necessary. They argue that the cheating was a scheme by a small group of engineers acting without their superiors' knowledge or authorisation. Once alerted by the US authorities, executives did not realise how serious the scandal would become, they add, believing it could be resolved amicably.